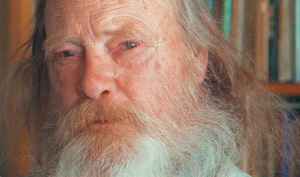 Hayden Carruth, AM’47, has the trappings of a successful writer, including the National Book Award for Poetry. But his long road to literary laurels has had more than its share of agonizing detours. Hayden Carruth was 33 years old when doctors told him he would never again live a normal life. He had served in the Second World War, earned a master’s degree at Chicago, and gone on to edit Poetry magazine, one of America’s most distinguished literary journals. In 1949 Carruth, AM’47, took the bold step—bold for such a young and unknown editor—of defending Ezra Pound, scorned for his pro-Fascist wartime broadcasts, when Pound received the Bollingen Prize. He envisioned a long career as a poet, critic, and editor. He never recovered completely, but he did manage to reenter the world. Drugs helped, as did the friendship of an understanding psychiatrist. So did music, work, the love of women, and two decades spent scraping a living in northern Vermont. There, far from the trodden paths of literary advancement, he began to regain his footing and find his voice. He did it by becoming “a yokel, a countryman, a guy who split wood and worked in a potato field”—and a poet of unusual range and power. His first book of poems, The crow and the heart, came out in 1959, five years after he left the hospital. Some 30 books followed, mostly poetry but also a novel, an anthology of American poetry, a collection of autobiographical essays, and a volume of letters to the poet Jane Kenyon published last September. He has published several collections of reviews—work taken to pay the bills but that has earned him a reputation as a first-rate critic. And he has written a book of essays on jazz and the blues, lifelong fascinations. Carruth today lives in the hilly limestone country between Utica and Syracuse. He and his fourth wife, Joe-Anne McLaughlin-Carruth, have a small red house perched on a hillside just outside the town of Munnsville, with a wide view of Stockbridge Valley. He bought the house on impulse in 1988 while on the faculty at Syracuse University, where he taught for a decade after leaving Vermont. A birdfeeder stands crookedly out front, and daisies and hawkweed flower in a nearby meadow. Traffic whooshes past, too close, on New York State Highway 46. On a gray, drizzly day last August, he rises late and eats breakfast at 1:30 p.m. This is typical for Carruth, who even as a child suffered from insomnia. With a raspy but cheerful “Come in! Come in!” he walks to the door in slippers, baggy shorts, and a sleeveless undershirt. His green eyes are small and watery, his skin sallow from too much time indoors. He trails a line of clear plastic tubing that delivers oxygen to his nostrils from a pump humming in his living room—the consequence of emphysema from a lifetime of smoking. 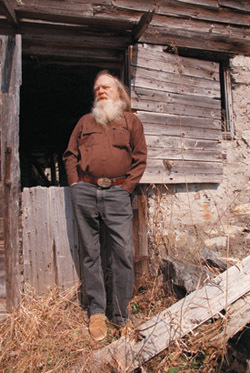 With untrimmed white beard and flowing gray hair, he has an ancient, wild look. Since open-heart surgery three years ago Carruth has moved more slowly. He sometimes shuffles up the road, pushing his oxygen tank in front of him, but even this modest exercise is difficult. He hardly goes anywhere except to accompany his wife to the store, or to visit her relatives in New Jersey. 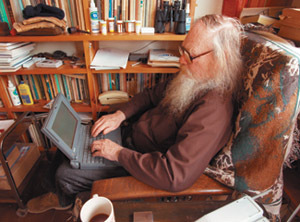 He gives occasional readings, as he did last fall in Vermont, but spends most of his time at home, watching birds at the feeder, listening to the radio or watching TV, or slouched in a soft chair in the middle of a cluttered study, tapping out letters or other work on his laptop. Carruth’s wife, also a poet, hovers near him, a slender woman with thick auburn hair. Despite a 30-year age difference, the two are close; they share their solitude in a town where both feel like exiles. Carruth’s poems pay frequent homage to his wife and her predecessors, sometimes in ways too personal for her taste. “He just has no sense of privacy,” she complains. “None! He’ll tell people anything. And he thinks that’s the way you should be in the world.” Carruth grins. Bluntness and candor are old habits. On the day after his 83rd birthday, Carruth is in excellent spirits. His wife brews coffee and serves leftover birthday cake, which he eats with relish. Sitting at the kitchen table, he talks for hours—by turns gracious, opinionated, and funny. “I’m pumped!” he says late in the day. herded to the gaunt fields of torture…. Carruth grew up in Woodbury, a small country town in western Connecticut. His father and grandfather were writers and editors, and he assumed he would follow in “the family racket.” He studied journalism at the University of North Carolina, Chapel Hill, where he worked for the student newspaper and met his first wife, Sara Hudson, AM’47, PhD’58. “He was interesting and full of life and ideas,” recalls Hudson, professor emerita of English at Auburn University. “We were all gung-ho New Dealers. We had a lot in common that way.” They married in 1943 on graduation day and enlisted in the Army, Carruth in the Army Air Corps (serving in Italy) and Hudson as a WAC. After the war they took advantage of the G.I. bill to enroll at Chicago. “We just thought it would be more fun to go to school than to get a job,” Carruth says. It turned out to be an intellectual awakening. His earlier literary education had been fusty and antiquarian. At Chicago he took courses in 20th-century literature, bought literary magazines at the 57th Street bookstores, and made friends with other aspiring writers, such as Henry Rago, a poet and teacher who became one of his closest friends. Carruth had been writing poems since childhood; now he began to write more seriously and with a heightened understanding of poetry’s possibilities. His job at Poetry also soured. He clashed with the magazine’s trustees, who felt uncomfortable with his forays into literary politics. For his part, Carruth chafed at restrictions: the trustees had insisted that other editors approve any poems the young editor published. Carruth’s behavior also offended. In the middle of the night, Hudson recalls, Carruth called up trustee Marion Strobel and, with his wife imploring him not to, told Strobel he was quitting. In January 1951, less than a year after he became editor, Poetry’s trustees replaced him. Agoraphobia is when a stranger enters the house and you go to the attic and lie down with your face pressed into the darkest corner, under the slanting slats of the roof. It’s the scream lurking in your gorge, so ready to burst that the least noise above a cat’s purr makes you tremble: when the marching band from the high school practices in the street outside you sit in the back of the closet, when the March wind lashes the treetops at night you crawl behind the sofa. Agoraphobia is when every night at 2:00 a.m. for five years—that’s 1,825 nights—you go out loaded with Thorazine to walk in the street beneath the dark, blank windows of the houses on either side, and you never get more than a hundred yards from your door. ... Agoraphobia is when you breathe and eat the dust of oblivion. Cigarette smoking was a way to cross the immense barrier between the Carruths and the rest of the world, which I wanted to do more than anything. I wanted to be ‘out there’ with the others, away from solitude and fear. I never made it and never will. Precisely how this dynamic knot of attraction and repulsion evolved over the years and became an ineradicable component of my being, is unknown to me. I doubt anyone could figure it out except in gross, uninteresting terms. But I know it is there, close to the heart of my psychopathological life, creative and destructive, a strength, a weakness, a function of the basic energy that has always driven me. After five years in his parents’ attic Carruth improved enough to move to Norfolk, Connecticut, where he lived in a cottage that belonged to James Laughlin of New Directions books—Ezra Pound’s publisher—whom he’d met while at Poetry. He did editorial work for Laughlin, and he met Rose Marie Dorn, a young refugee from Eastern Europe. In 1961, at age 40, he married for the third time. The couple had a son, David, and when they went looking for a home they concluded that the only place they could afford to buy was in northern Vermont. They found a house with 14 acres and a creek outside the town of Johnson, near the spine of the Green Mountains, 25 miles from Canada. Earning a living meant doing manual labor during the day and hackwork in the evening. Only after midnight could he turn to poetry. In his workroom, a one-cow barn he had wired and fitted with a woodstove, he wrote until five or six in the morning before going out to shovel snow or to split wood. His country poems are among his most popular and highly praised. Poems like “Marshall Washer” describe with intimacy and straightforward affection the land, its inhabitants, and a way of life that was dying even as he wrote about it. past (backward utopians that we’ve become). Then, if you had the makings. In those days. It’s all changed now. By 1979 Carruth was working 80 to 90 hours a week and still earning too little to support his family. He tried unsuccessfully to find full-time work at a Vermont college or university, and when Syracuse University offered him a professorship in its graduate program in creative writing, he left Vermont—and his wife—for suburban Syracuse and the more conventional academic life of a contemporary poet. It took him time to get used to teaching. His anxieties persisted; too afraid to cross the university quadrangle, he skirted around the edges. In 1985 he returned to Vermont, but a year later was back in Syracuse. In 1988 a breakup with a girlfriend led him to attempt suicide. Still, Syracuse led to a new stage in his development as a poet. Living on the city’s outskirts he began writing poems inspired by people he encountered along the commercial strips, poems gathered into Asphalt Georgics (New Directions, 1985). And a series of honors arrived. It was the professorship, Budbill suspects, that finally admitted Carruth “into the circle of acceptance” and led to his Collected Shorter Poems: 1946–1991 (Copper Canyon Press, 1992) earning the 1992 National Book Critics Circle Award. Four years later Scrambled Eggs & Whiskey: Poems 1991–1995 (Copper Canyon Press, 1996) won the National Book Award. Carruth still writes poems, but not often, and none that satisfy him. He has abandoned his most ambitious project, a four-part epic called American Flats, which was to have begun with the conquest of Mexico. He’s too old, he says, tapping his forehead. More and more thoughts of death crowd his mind. Most of his old friends are gone, including his Vermont neighbor, the farmer Marshall Washer, who died in 2003. So it is for the old man in his cave of darkness, regretting his arthritis and impotence and failing imagination. The knowledge of communion is still there. Richard Mertens is a freelance writer and a doctoral student in the Committee on Social Thought.